I love this little Bible passage! At the apostolic meeting in Jerusalem, where it was to be decided what rules and customs should be followed by Gentile Christians, those who have assembled take a testimony break to hear about some miracles. This I believe was both because they illustrated a theological point given by Peter – that God is already working among the Gentiles even before they had been circumcised – and because miracles are very cool to hear about. Seriously, not many grow tired of hearing about miracles. Right now, I’m at a Pentecostal conference in the northern parts of northern Sweden, where the sun never sets and penguins ride around on polar bears. I’m helping the aid organisation of Swedish Pentecostalism, PMU and collects money for Denis Mukwege’s Panzi Hospital in Bukavu, Congo. It’s my first time at the conference and it’s nice, the vegetarian food is a little meh and the topics being talked about at the meetings and seminars aren’t always that radical, but overall it’s OK. I guess that for an outsider, at first glance, the conference is like any conference or festival – people drinking coffee and eating ice cream, chatting and laughing, going to concerts and lectures. Of course, the topics are Christian and the songs are to God, but that wouldn’t matter much for a nonbeliever. The real game changers I believe are partly the eternal issues about the afterlife and salvation, and partly signs and wonders telling us about the truth of these eternal issues. And God is working through many in Swedish Pentecostalism hallelujah, so testimonies about amazing miracles can pop up anywhere. 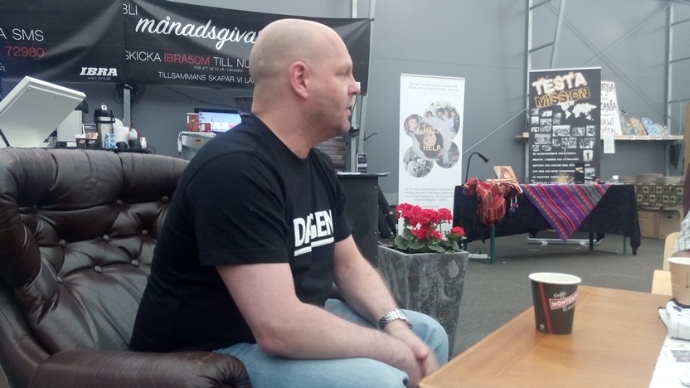 For example, in front of our stand is the stand of the biggest Christian newspaper, Dagen. In it sits a guy called Örjan who seems like an ordinary Swedish man. For those who want to listen, however, he shares some of the amazing miracles he and his friend Simon Ådahl have experienced, like when they prophesied into several people in an American bar and led many to the Lord, or when he met an angel who gave him instructions and advices from the Lord. Yes you do. Church gets less boring when we talk about and experience God’s miraculous power. So make sure that testimonies are a mandatory part of the church meeting, and give the mic to the wonderworkers at church conferences. By Micael Grenholm in Church & Theology, Signs & Wonders on July 1, 2015 .